Tonight I was introduced to Google Finance by Aaron. At a first glance it’s very “Google”. Not a lot of data, a simple design, and information that they’ve harvested from the Internet. But, if you take a closer look at a stock chart, you will be blown away. Or, well, at least I was. The ticker pages are very simple and easy to read and contains points on the chart that correspond to news stories from Google News. How cool is that? Now you have a pinpoint on when news breaks and how stocks react. This is great. No longer do you have to do this yourself. Or, well, if you did ever do that, now you don’t have to. Also, drag the top bar around and you can watch the chart and the new pins change in real time. Really neat stuff here. Now, this does come at a cost. 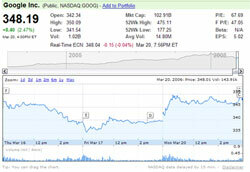 Google Finance only provides very basic data about each of the stocks. But, it provides the majority of data that you’d want: ticker, real time ECN, balance sheet, income statement, summary, competitors, their segment, and so on… There is not a ton of extra information listed, like you might find on Yahoo! Finance. But, the neat news visualization is worth the look. One thing that they could to to fix it up is to use the ticker in the url everywhere. None of this number business in some places and the ticker in others. Take a note from Yahoo and almost any other site that deals with quotes. But besides that, I’m really impressed so far. Let’s see if it can replace my Yahoo Finance! page.